Nothing could have prepared me for the views and emotions ……. When I joined Whytake, the photo-community, one of the first people I was in contact with was Kerstin. She was very enthusiastic about my tree images, because she was missing them in Iceland. Her enthusiasm and passion about nature reflects in her photography. 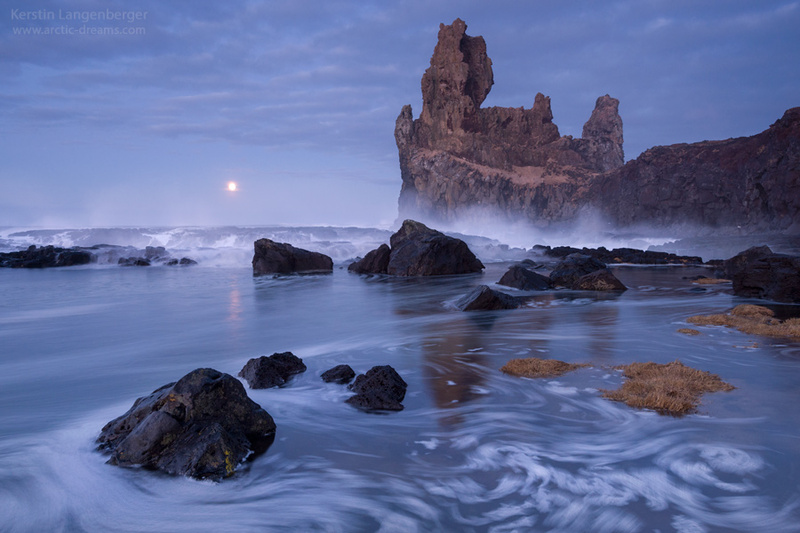 Her works guides you to breathtaking landscapes with snow and green skies or magnificent actions from volcanic eruptions. You can just feel the emotions that she must have felt then. Her latest images were taken in Salisbury Plain, South Georgia where she works as a Arctic nature guide. These images just want you to join her and experience the same thrill. For those who do not know Kerstin Langenberger, I am very happy I can introduce her to you on Visions and Nature. Enjoy and be inspired by her work! I grew up in Germany and have always been a child of nature. After high school, I went to work on farms in Iceland which is when I started taking photographs. I ended up staying in Iceland, studied environmental science and tourism, engaged myself in conservation – and spent more and more time out in nature together with my camera. Today I work as a photographer and ‘Arctic Nature Guide’ in the polar regions, mainly in Iceland, Svalbard and Antarctica. When I look at your images I see a lot of cold, fire and emotions. 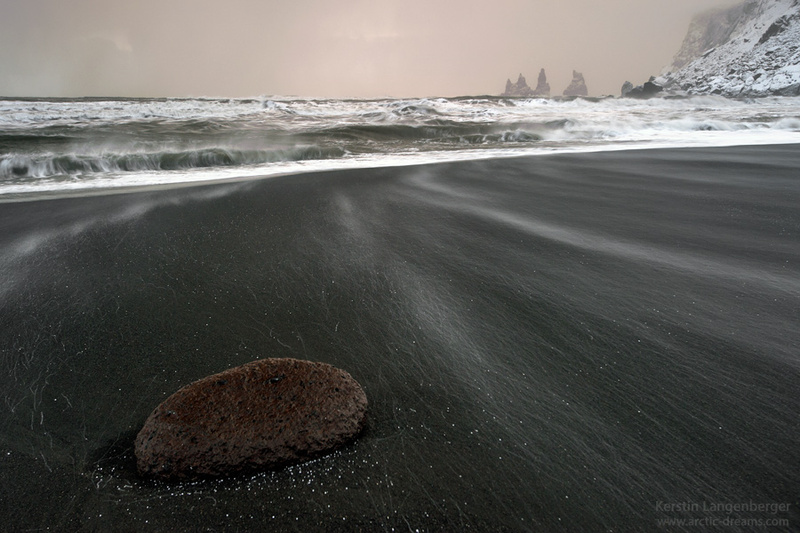 Lots of different moods, a combination of them all you seem to find in Iceland, your homeland for years. What is it that attracts you to the north? The purity of nature. The primordial landscapes. 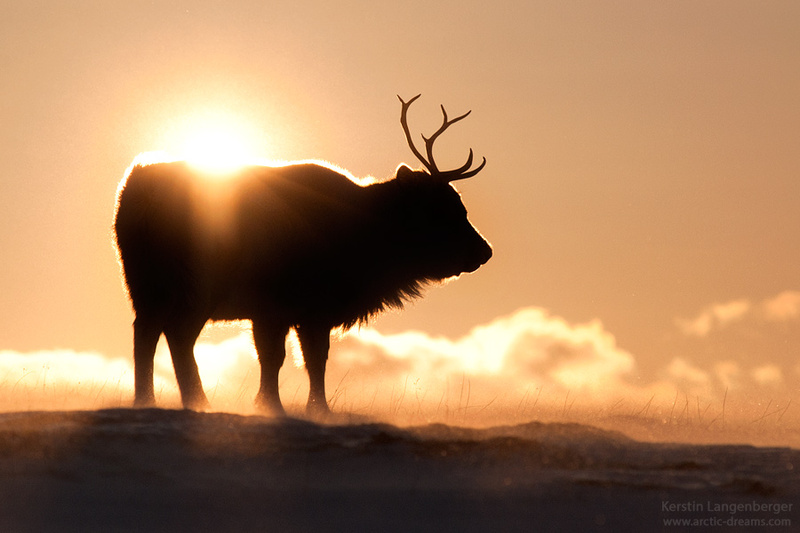 The contrasts and extremes: be it the weather, the cold, the light or the moods. And the changeability of it all: nothing ever stays the same. Nature always surprises me, fills me with wonder and teaches me something new every day. At this moment you are in Antarctica on an expedition boat, where you work as an Arctic Nature Guide. A photographer’s dream I think? Definitely! That’s why I chose to work as a guide. I want to be in nature as often as possible and share my compassion for it with others. When I’m not too busy with keeping my guests safe and guiding them through the polar regions, I can even take photographs alongside. It’s perfect! Every photographer will enter nature in a different way, prepared or unprepared. When you go out in the field do you already have a combination/subject in mind or do you let yourself get inspired by nature? Both. To me it is all about being outside: the more I know about nature or a certain place, the better I feel prepared, even when not working towards a particular motive. I like to explore nature and focus on whatever she has in store that day. But I also love to work towards a specific photograph, waiting days, weeks or even years for the right weather and light conditions. In both cases I’d say that nature inspires me while I photograph! 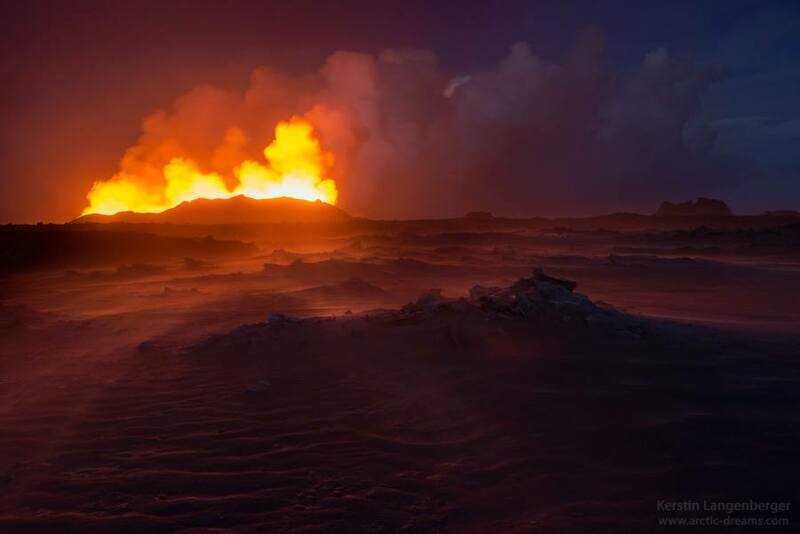 You were lucky to get permission to go to the Bárðarbunga volcano at the end of September during the Holuhraun eruption and you were able to take some amazing images. This kind of nature activity is very sudden and you can not plan these things. Can you tell us briefly what happened and what made this trip so special for you? Together with photographer Olaf Krüger, you have an ongoing photography project ‘ Islands of the North’ that started this January. Can you explain what it is about and if you plan to do go outside Germany with an English version of the project ? What are your photography goals, destinations for 2015 and what would you like to achieve ? I will keep on working in the polar areas and the German-speaking countries, trying to open others’ minds for the beauty of our natural world and the urgent need of protecting it actively. The polar regions are home to what I believe are the most beautiful landscapes and fascinating animals on the planet: we should do whatever we can to preserve them for us and the generations to follow. My favourite photograph is one that I have been dreaming about since my childhood days. I was (and still am) a huge admirer of Katia and Maurice Krafft. Like them, I wanted to get so close to an erupting volcano that I could see, hear, smell and feel glowing lava. 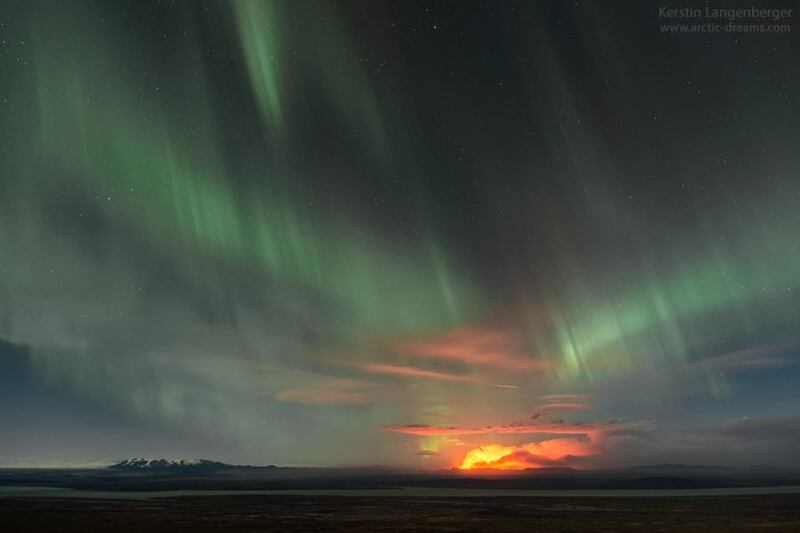 This dream came true three months ago at the Holuhraun eruption in Iceland. By then, the volcano had been active for one month, spewing out enormous amounts of lava. 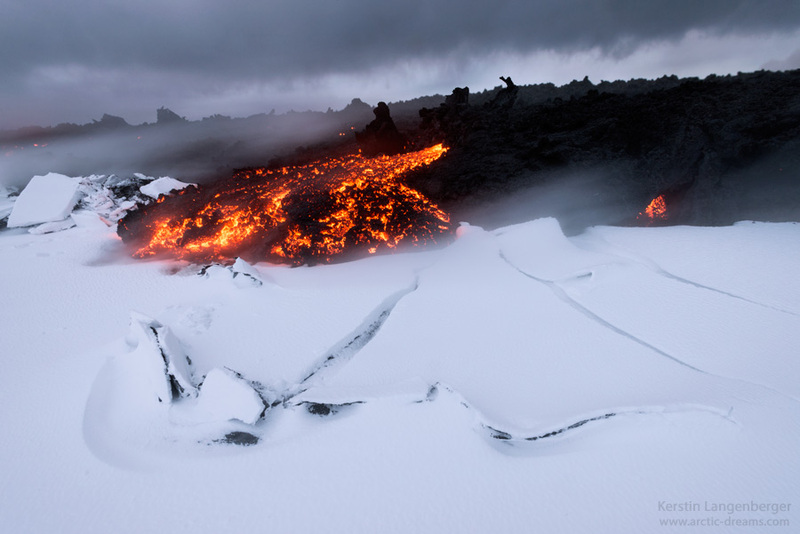 Inside the lava field, visible only from the air, was a river of molten lava. 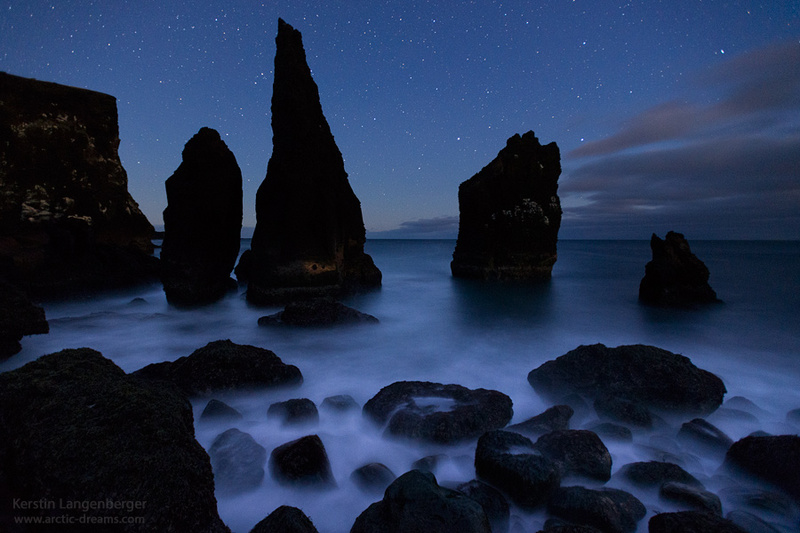 When it got dark, that river of glowing rock lit up the entire horizon. It was a breathtaking sight – and a humbling reminder of how insignificant and small we humans are in the face of nature. Most of the year I am traveling and working outside of civilisation, so I have very little time for marketing myself or organizing exhibitions. Still, two things are coming up in the next weeks, both in connection with my project ‘Islands of the North’. Right now, Olaf Krüger and me are publishing a coffee-table book about the ‘Islands of the North’, and from January to March we will be touring the German-speaking countries again with our show. Exciting weeks are lying ahead! I love these shots for their monochromy and moods. Both of them are beautifully simple, balanced and resting in themselves. Real eye candy! Coming up next, in the “Interview-Series” : Kristel Schneider , don’t miss it! (last interview) . Great Interview, I always think of Ice, Fire & Emotion when I think of Kerstin’s work.